He said Brett McGurk, the US envoy to the coalition against so-called Islamic State, was "definitely" supporting the YPG in Syria and the separatist PKK. Turkey sees the YPG (Popular Protection Units) as a terrorist group linked to the PKK, which has been fighting inside Turkey since the 1980s. But last week the Pentagon said it was directly arming YPG fighters as they moved towards IS's Syrian stronghold of Raqqa. On his return to Ankara, the foreign minister said Turkey had been assured that after the operation in Raqqa, territory seized from the jihadists would be handed back to the local Arab population. But he said Mr McGurk was openly supporting the Kurds and "it would be beneficial" if the US special envoy left. President Erdogan told Turkish media in Washington that he had told Mr Trump that Turkey would hit back "without asking anyone" if it came under attack from the Syrian Kurds. His visit was overshadowed by violence outside the Turkish ambassador's home. 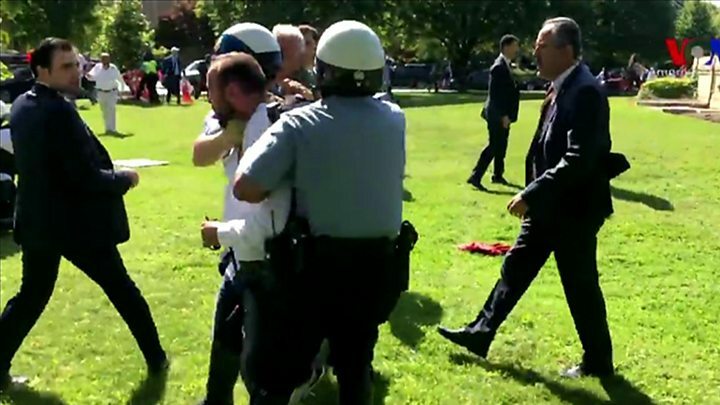 Police in Washington said the clash "appeared to be a brutal attack on peaceful protesters" and video footage showed men in suits charging past police to kick and punch a group of demonstrators. 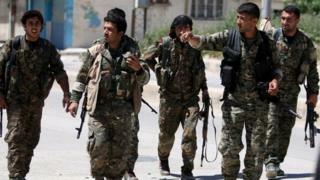 The Turkish foreign minister said Germany was free to move its troops if it wanted to. "We are not going to beg," he said. "They were the ones who wanted to come and we helped them." The Turkish refusal was ostensibly in response to Germany's decision to grant asylum to Turkish military officers accused of backing last year's failed coup against President Erdogan.